Prop 57 Frequently Asked Questions! CDCR released their draft Regular Regulations on how they will implement Prop 57. These Regulations are CDCR’s proposal, and the public has a right to weigh in during a 45-day written public comment period, which ended on September 1st. On Friday, Sept. 1, about 250 community members showed up to CDCR’s Prop 57 public comment hearing in Sacramento. About 100 people gave comment, and only 5 of them were comments in opposition to our demands! Our voices overwhelmed the conversation, most of them calling for CDCR to expand their implementation of the Prop 57 regulations! Mobilized the public to send written comments to CDCR! Mobilized the public to come out to the Prop 57 Regulations Hearing at the State Capitol! 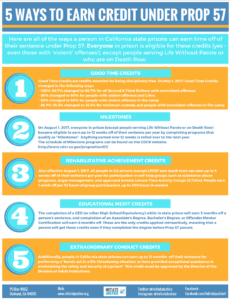 On Nov. 29, CDCR released the long-awaited, final draft of the Prop 57 Regulations. Initiate Justice met with CDCR Secretary Scott Kernan personally, where he told us that they received 41,000 comments from more than 12,000 individuals, and that most of the comments asked for credit earning to be made retroactive, for Third Strikers to be included in non-violent early parole consideration, and credits to come off of people’s Youth Offender Parole Dates. Despite this incredible outpouring of support from the community, CDCR is NOT planning on making any of those recommended changes. Rather, they are making small, technical, and clarifying changes such as allowing people in prison to re-take certain Milestone eligible programs and clarifying that people in Administrative Segregation and the SHU are eligible for credit earning (unless they have other restrictions). The full text of the updated regulations can be read here. We are beyond disappointed that CDCR chose not to support what the people called for in implementing Prop 57. But, even though we did not win our demands, this campaign has still been a victory for the people, and we will continue to fight! Because the people stood up, CRCD had to read through more than 41,000 comments and will be sending responses to more than 12,000 people! Because the people stood up, the good things about the Prop 57 Regulations were upheld, despite the opposition’s efforts to undo them! Because the people stood up, CDCR has been reminded that people in prison and their loved ones will continue to be at the front of the fight to end mass incarceration and keep our communities safe! Initiate Justice is going to continue to work to build the power of people in prison and their loved ones. Breaking down this oppressive system will not happen overnight, and it will only help when the people most impacted by incarceration stand up and stand together!